We’d like to thank everyone who has viewed and commented on our Greatest QB of All-Time Preview. 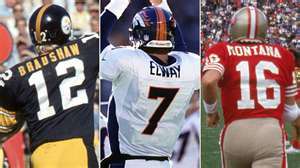 There have been so many great names put out as the greatest ever from Otto Graham to Johnny Unites to Joe Montana to Dan Marino to John Elway to name a few. In every case the comment was there is “no question” who was the best. That’s what has made this so interesting. Feel free to go to our original post and read all of the comments. There were also many comments on Facebook and LinkedIn in different groups. With that said, we will be posting the results on Friday morning. Feel free to comment. I’m sure there will be more debate when you see how things turned out. Remember we have 8 regular season categories and those results. We then added 2 Super Bowl related results, Super Bowls won and Super Bowls played in and calculated the numbers again. You can see it all. Thanks again for the interest and we’ll see you when the final results are posted.